The American Council on the Teaching of Foreign Languages (ACTFL) has released the ACTFL Proficiency Guidelines 2012 for Speaking, Writing, Listening, and Reading. Read the press release for full details. Check this out! The MERLOT World Languages Portal is an educational resource for teaching and learning languages. You are invited to join and contribute to this growing learning community by using the online materials and submitting your own modules for inclusion in the collection. You will find a wide variety of materials for use online and in the classroom. Please join MERLOT now and become a part of the World Languages Community. If you have any questions or suggestions, please contact the Editor of the World Languages Editorial Board. Professional development programming for K-12 teachers FREE through our satellite channel and Video On Demand. The New York State Association of Foreign Language Teachers website has a series of podcasts (free) and webinars (that can be viewed after the purchase of a key). T BOB -Tennessee Bob's Famous French links. AATF - American Association of Teachers of French. 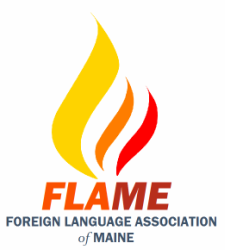 NABE - National Association for Bilingual Education: see especially for L'Acadien du Haut St-Jean site, a bilingual school (French and English) in Aroostook County, Maine. J. Becker, Webmaster and professor emeritus, retired from the Univ. of No. Iowa a number of years ago and enjoys keeping this page current and adds to it regularly. Great Song - contains more than 2 million songs, lyrics of 500.000 French songs both old and contemporary, 50,000 translations (English / French), and it is a popular website in this area of interest. French Professor: 15 French Movies That Will Change Your Life - French movies-a helpful resource for researching French film on the Internet. If you are not on the mail list from France 5, it is suggested that you join, really good for keeping up to date with what's going on and with resources. I am a Bates College alum and now a French teacher at Marblehead Veterans Middle School in Massachusetts. This past summer, I was on the Boston Bruins I.C.E. School committee and developed hockey-related lesson plans for French. The hockey-French relationship is a strong one since so many NHL players are francophone, including the Bruins' Patrice Bergeron, Daniel Paille, Jordan Caron and coach Claude Julien. They are free and it only takes a few seconds to sign up. They are suitable for any grade level, but are geared toward beginners (French 1). Hockey is a great way to get kids excited about French! It has really helped me grow my program. Sign up and help keep French alive in New England! J'ai passé une année à enseigner le français à l'Alliance Française deCarthagène (Espagne) et j'ai créé un site qui peut intéresser les professeurs de français de votre association. Resolve, Chapter 17, LD 77 passed by the 125th Maine State Legislature directed the Department of Education to create a resource guide in cooperation with Franco-American Specialists from the University of Maine System. The guide has been designed to assist K-12 teachers and students in locating available Franco-American resources about Maine and New England. The new sortable guide organizes resources for your consideration by discipline, grade level, source type, time period, and location. To view the guide and links to other online repositories with numerous resources, visit http://www.maine.gov/education/lres/ss/franco-american/index.html. AATG-American Association of Teachers of German. Webmaster / Professor Emeritus University of Northern Iowa Jim Becker, Webmaster and professor emeritus, retired from the Univ. of No. Iowa a number of years ago and enjoys keeping this page current and adds to it regularly. JALT- Japanese Association for Language Teaching. J. Becker, Webmaster and professor emeritus, retired from the Univ. of No. Iowa and enjoys keeping this page current and adds to it regularly. Lingo24's ContexTrans service is a free tool combines both Machine Translation (MT) and Translation Memory (TM) technologies and allows you to search for real-world translations of a word or phrase between two languages. These results are derived from high-quality human translations and allow you to see the context in which the words are used in a foreign language, helping you to choose the most appropriate translation. If you have a passion for the Chinese language and want to broaden your linguistic horizons then we place a fascinating tool at your disposal - Parasaurus Rex Chinese. The joy of languages is in their variation. Why stick with one translation time and time again when there are often so many alternatives? We'll prompt you with alternative words and their context and you can take your pick. Go on - spice up your language! Asia Society is proud to present this first issue of our monthly electronic newsletter as part of our efforts to promote high-quality Chinese language education in the US. Please disseminate this newsletter among colleagues or friends who might be interested in the initiative. We also welcome your feedback and contribution to our future issues. Please click http://askasia.org/chinese/announcements/newsletter0107.htm to read the newsletter. The Chinese Learning and Cultural Center of Maine (CLCCM) is an umbrella organization that lends its planning and organization skills to a variety of activities that attempt to bridge historical and cultural differences and maintain a pacific and productive dialog between the People’s Republic of China and the United States of America. Focusing on Chinese language education for students and adults, shared cultural events, local and state-wide public service, and active engagement with the greater community at all levels, the organization plans the curriculum for the ever-growing Bangor Chinese School and that organization’s educational services to public schools, private schools, adult learners, teachers, and business people in Maine. http://www.uni.edu/becker/Russian2.html J. Becker, Webmaster and professor emeritus, retired from the Univ. of No. Iowa five years ago and enjoys keeping this page current and adds to it regularly. http://www.uni.edu/becker/Spanish2.html J. Becker, Webmaster and professor emeritus, retired from the Univ. of No. Iowa and enjoys keeping this page current and adds to it regularly.